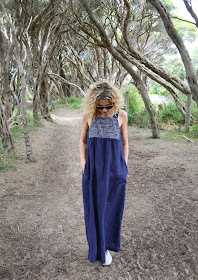 Sew Tessuti Blog - Sewing Tips & Tutorials - New Fabrics, Pattern Reviews: Our new pattern - the Annie Dress! what's new in store, fashion trends, pattern reviews, Tessuti creations, sewing tips and techniques. 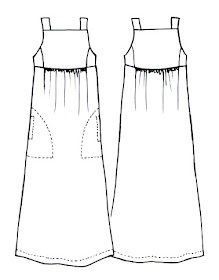 Our new pattern - the Annie Dress! Introducing our latest pattern - the Annie Dress! 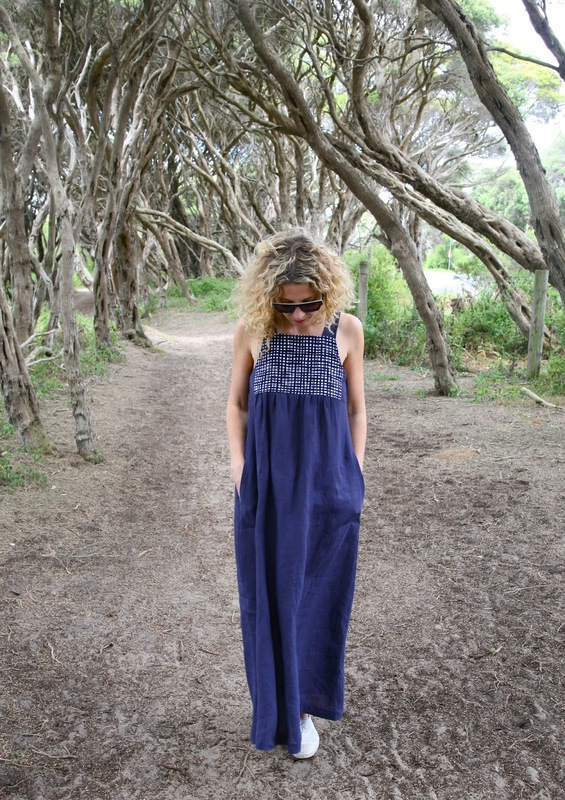 This loose, light maxi features front and back yoke with separate side panels and sewn in pockets. The dress is gathered beneath the yoke while the cutaway armholes extend into shoulder straps to create a sweet and flattering neckline. The plain fabric in Lisa's version (pictured above and below) is our Hartford Ink linen and the contrast front yoke is made from a vintage Japanese cotton sourced from the stash. My black version (below) is made up in Hartford Black and the yoke features our Black Embroidered Eyelet (linen with cotton embroidery - available Chatswood only). Coral made her gorgeous spotted version (below) in navy/string Japanese linen. There's still a wee bit of this fabric left at Surry Hills only. And how great does it look with those red shoes...? And speaking of red, let's finish of this post with a suitably festive Annie. Gabby's version (below) was made up in our Hartford White linen and the front yoke is a white cotton eyelet (available Chatswood only). Once complete, we overdyed it using Crimson iDye and ended up with the most luscious raspberry shade. Most of these samples were completed in the last few weeks, have already been well worn and we're pleased to report that this design has passed the hot summer's day test with FLYING colours! 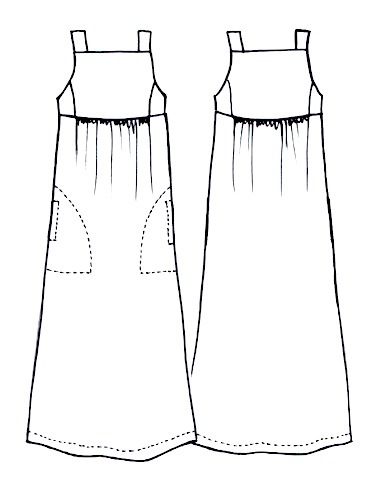 The Annie Dress pattern is now available in both hardcopy and PDF print-at-home/print copy shop versions. Each pattern includes sizes Australian sizes XXS-XS-S-M-L and XL. Looks great.... are there any closures on this dress, or is it cut away enough that it can just be slipped on? Thanks Belinda. Absolutely no closures on the Annie Dress, easily slips on and off! So gorgeous! I can't wait to make this. The yoke is good way to use up leftover fancy fabric! Thanks Carla. Just the perfect size for those left over fabric scraps we hate to discard or for a little bit of something fancy. You have been busy! Another lovely pattern. We need to make this into a top too! Love it! A top would be fabulous too Christy! They are all so lovely! Is there a sample in the Melb shop to try on? Hey Rachel. In the meantime, my version (XXS) is available to try for size. Fantastic! We can't wait to see your Annie Dress, Leah! Love this one! Am going to make asap. I love this pattern, but to wear it myself I'd have to set the straps further apart and add fabric at the sides of the bodice and under the arms - all of which sounds a bit risky for a relative beginner! Any chance of an adapted version? Hi Caro. We'd recommend a pattern modification class if you wanted to seek guidance on how to do this. Has anyone tried a FBA on this dress?